Flat panel monitors are lighter and easier to transport than tube TVs. But, how do you mount them in a way that keeps them easily movable and portable? The answer is the MS-86 flat panel monitor stand. 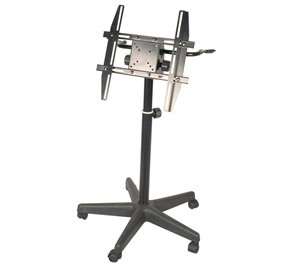 The wide 5-point wheeled base will provide stability to protect your monitor, and mobility to suit your positioning needs. It also has two microphone holders, so its perfect for media presentations. Custom Stand for LCD TV/Monitor size 14"-32"
Audio 2000 (AST4202) TV/ Monitor Stand Size: 13" � 19"
MidtownSounds.com. 2000-2010, All Rights Reserved.